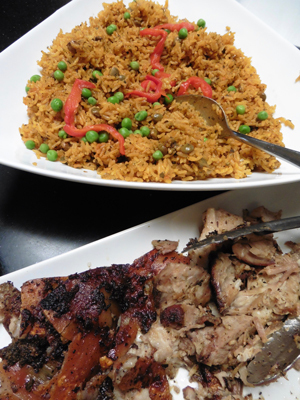 Arroz con gandules (top) with pernil (below). 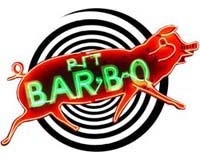 When Charlotte’s ninth annual Puerto Rican Festival cranks up this Saturday in Marshall Park, don’t miss the roast pork. There’ll be music, to be sure. Nine ensembles will share a range of Latin sounds — from brassy big-band salsa by Charlotte’s popular Orquesta Mayor, to young vocal duo NG2 coming direct from Puerto Rico. “I’m most excited about Odilio González,” says Alba Colon-Nieves, who organizes the festival with Charlotte’s Puerto Rican Cultural Society. “He tours throughout Latin America, a singer of the traditional Puerto Rican music.” González’s jíbaro style records, dating back to the 1960s, influenced pop star José Feliciano among others. While you listen, don’t miss a rare chance to sample down-home Puerto Rican cuisine. Nearly a dozen vendors will be on hand. Most cook for catering clients but seldom get to show off their traditions in public. Tara Quinones’s parents came from Puerto Rico to New York City. 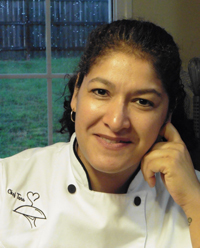 One will be Tara Quinones, whose busy Monroe-based Catering by Tara serves Olde Providence Racquet Club among others. She grew up outside of New York City in the Catskills where her Puerto Rican family ran a popular resort, a destination for Latinos. For the festival she’ll make pernil with arroz con gandules — roast pork with rice-and-pigeon-peas. “My family, we were raised on this meal,” she says with pride. She rubs the pork with a homemade spice mix called sofrito, then slow-roasts it for hours. The skin becomes leathery and crunchy, locking in juices. Grab a bit of the skin, called cuero, for a taste treat. At her family table, “if you’re dumb enough to get up from your seat, we’ll steal your cuero,” she laughs. 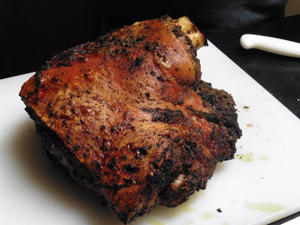 A sofrito rub gives the roast pork a leathery, crunchy exterior called cuero. Saturday July 23, 2016 Noon – 8 p.m.